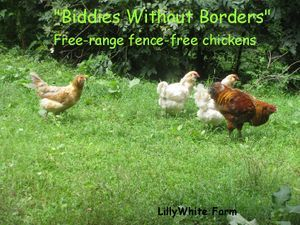 Our poultry are free-ranged, pastured here. There is grassy areas, and woods. They roam all over our land, scratching in the leaves for bugs, eating grass, finding a nice place for a dust bath, or cooling off under a tree. They only go in the coop at night to protect them from predators. They are raised stress-free, and have all the freedom there is. We have no fence to keep them confined - except at night. Because they forage like normal chickens, they take longer to grow (commercial Cornish Rocks take 7 weeks to be full grown) and they don't have the leg problem that most commercially raised birds have. domain. The girls gossip and chat to each other and will brag when they lay their eggs. When the birds are fully feathered and grown, you will see the "ear lobes" on the side of their head. The ones with the red ones will lay brown eggs, and the ones with the white will lay white eggs. After the first couple of eggs come, if you are observant, you will be able to tell which egg belongs to which hen as each egg is distinctive to that hen. Each chicken will have their own personality. 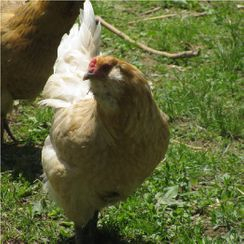 I had a chicken that would always run to me and make her soft clucking sounds as if asking for a handout. She was always the first one to spot me coming out of the house. 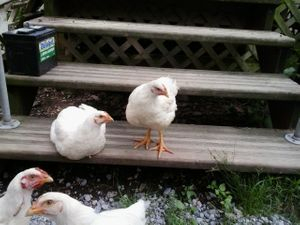 Interested in starting a small flock? 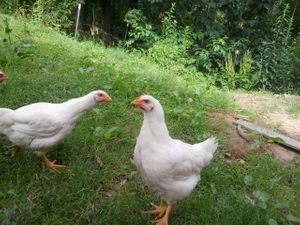 In general, you can have 3 hens (no rooster or crowing involved) and get 14 eggs a week! That's 2 eggs a day!